Change4Life proudly presents: GSC’s inaugural guide to (practical, functional) fitness fashion* *Aka: how to make the absolute best out of your workout experience using the latest and greatest in workout wear and tech. Workout clothing and exercise gear are not one-type-fits-all. We live in the ClassPass era, which means we're not just sticking to one kind of workout. One day, we might hit a Beyoncé-themed cycling class; the next, we're (trying and ultimately failing at) channeling our inner Muhammad Ali in the boxing ring (and let's not forget about the new hybrid pilates/spin/yoga studio we stumbled upon last weekend). Of course, some of us just strap up old beater shoes and walk or run around in circles. It all works. The state of our workout-clothing drawers, however, hasn't always been up to par — and for whatever reason, fashion and the thrill of sporting brand names in today’s day and age (to ultimately sweat in, no doubt) seems to trump functionality, like...tenfold. From our chosen brand of leggings, to the type of water bottle we’re using for the sole purpose of hydration, becomes dictated by big name brands and “influencer” hype (you know, in this new era dominated by bloggers and vloggers etc.). If we’re going to dip our toes into a variety of physical activities, we might as well make the most of it — $40 sweatband and all. While the “athleisure” world is indeed dominated by pricey goods, we’ve rounded up a ton of affordable picks that will help keep you on track – from the best gear, to the best (free) apps – we’ve got you covered. So sync your Fitbit with GSC’s Change4Life® health portal, and let’s get started! For the yogi – Contrary to popular belief, it is possible to rock some amazing yoga wear that won’t set you back $150 for a pair of basic leggings. Canada’s very own Joe Fresh is not only budget-friendly (products range from $16-50), but also carries a variety of both trendy and practical active pieces...for both men and women. While they lean mostly towards yoga wear, the loose fit of their clothing and breathable fabric are also great for those extra-sweaty gym sessions. Joe Fresh Active is available in Joe Fresh stores and online. For hydration – As everyone knows, hydration is a must when it comes to fitness. A good water bottle should consist of two things: 1) Be easily accessible and 2) Should keep your water cold (you’d be surprised at how many high-end bottles fail at these two very basic things). This tough (and super affordable) bottle from CamelBak, has an angled spout so you can drink while moving and without squeezing (meaning the contents won’t end up down your shirt mid-sprint). Perfect for some gym cardio or a back woods hike. 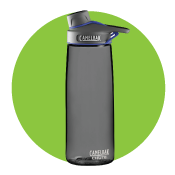 CamelBak Chute Bottle, $18.00, is available at MEC, Sporting Life and Bed Bath & Beyond. There’s an app for that ! – Hiring a personal trainer can be a major investment. But thankfully, it’s 2017 and shelling out cash to meet one-on-one with a certified personal trainer isn’t always necessary when equipped with a smartphone. Sure, lots of inspiring trainers exist on Instagram to get you motivated and excited to work out, but if you’re looking to create a personalized fitness plan, you’re going to want to use an app (or many apps!) to focus on your workouts, track your success, and plan your goals. Whether you’re a gym rat, at-home-workout obsessed, or training for a race, there’s an app to help you exercise better and more effectively. Our favorites include 7 minute workout and Nike+ Training Club – both free, and come fully loaded with 100+ workouts, audio and visual guidance from experts, and more. 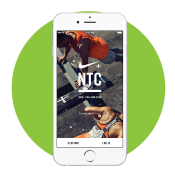 7 Minute Workout and Nike+ Training Club are available on both iPhone and Android platforms. For the fitness newbie – The first step is often just that: a step, literally. By stocking up on a tracker, you’ll be more encouraged to keep doing what you’re doing, to move more, and to be more conscious of your daily habits. It’s a great way to welcome those first starting out into the wonderful world of health. Our preference? Easily the Fitbit Flex 2. There’s a reason Fitbit was one of the first activity tracker makers to break into the fitness market, and is still going strong today – it works. And in the case of the Fitbit Flex 2, it works with lots of features for a fairly low price. The Flex 2 will do all the usual step, distance and calorie burn tracking using its motion sensor smarts. But it goes further — you can also track your sleep, and even do exercises that the band will automatically detect and track. Everything syncs wirelessly to the smartphone app and offers clear feedback to help you make progress in your fitness. The only downside? No designer collaborations, which means it’s best for the serious newbie — one who doesn’t mind the distinct look of a basic fitness tracker (no bells, whistles...or Vera Wang). 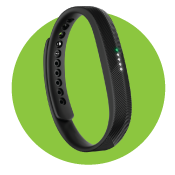 FitBit Flex 2, $129.95, available at Hudson’s Bay, Best Buy and Bed Bath & Beyond.